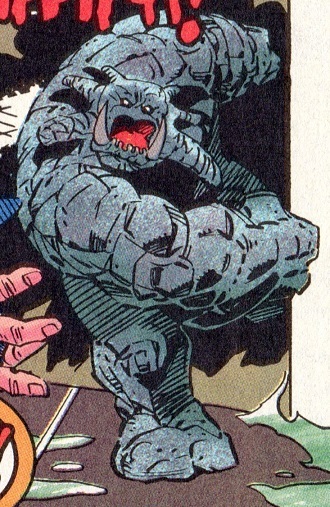 Wolfsbane called it "yon beastie" and "rock-thing"
Powers/Abilities: Assuming the one Urg seen was representative, Urg's are massive creatures at least covered in a rock-like exo-skeleton if not made up mostly of solid rock. Even a freshly hatched Urg is strong enough that Strong Guy (Guido Carosella), who can lift around 50 tons at his baseline level, remarked that it was stronger than he. Urgs apparently generate electrical energy that they can project from their eyes. When immersed in a canal or other water supply, the electricity spreads into the water, electrocuting anyone in immediate contact with the surrounding water. 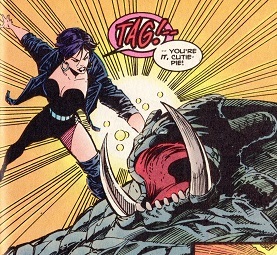 Urgs can also absorb and disrupt electromagnetic energy, temporarily draining the power of the mutant Polaris (Lorna Dane) for example. Urgs have a pair of large, white mandibular canine teeth, perhaps 8-12" long, Between these are 6-8 (the number varied between images) incisor-like teeth, with significant space between each tooth. The do not appear to have any maxillary/upper teeth. The inside of the mouth appeared to be a reddish-color and appeared to be more consistent with the oral mucosa of organic beings than any solid rock structure. They also appear to have a tongue. The oral cavity appeared to continue back into a dark pathway, presumably intended to represent the oropharyngeal region that would continue into some version of an alimentary (gastrointestinal) canal of some sort. This would presumably indicate they consumed foodstuffs of some sort. Urgs hatch from eggs. Apparently once they emerge from the egg, they rapidly grow in size. It is unrevealed whether they have eggs similar to birds, fish, or reptiles, or whether they bud off from their parents in a ovoid egg-like structure within which they develop and from which they eventually emerge. Traits: A newly hatched Urg tends to rampage, smashing anything around it and attacking anyone within range. It is unrevealed whether adult Urgs behave similarly. Urgs may only speak in growls, but it is also is quite likely that the newly hatched Urg was more like an infant and could not speak. It is unrevealed if the Urg speak, and/or if growls have specific meanings beyond expression of rage, frustration, etc. "Aarrroooo!" (X-Factor I#110 (fb) - BTS) - At some point, interstellar mutant Lila Cheney stole an Urg egg from its homeworld. (X-Factor I#110 (fb) - BTS) - She stored the Jewels in a bag and kept them with much of her loot in her personal Dyson Sphere. (X-Factor I#110 (fb) - BTS) - While Lila was out on her "How Can I Miss You When You Won't Go Away" tour, extraterrestrial thief Jornik raided Lila's Dyson sphere, taking everything she had her her vaults, including the Daedalus Wings, Harmonium (a device Lila had taken from the powerful K'lanti), the Jewels of Seven Suns, an Urg egg, and presumably a Bretilian Bondar +/- a D'Baaran image inducer. (X-Factor I#110 (fb) - BTS) - Jornik stored what he had stolen from Lila on Earth, within a decaying hotel in Madripoor's Lowtown that formerly boasted its exclusive location on the canal, but which now found itself in the canal as the filthy waters gradually eroded its decaying foundation. He figured that Lila would not think to look for him on her home planet. (X-Factor I#110 (fb) - BTS) <"cycles" before the main story> - Having fled the planet Boh-Tan-Ee, Jornik traveled to Earth; exhausted by his constant flight, he crashed his ship in the fetid harbor/canal waters of Lowtown. The impact apparently caused the Urg egg to begin to hatch. (X-Factor I#110 - BTS) - Teleported there by Legion (David Haller), X-Factor (Forge, Havok/Alex Summers, Polaris/Lorna Dane, Strong Guy/Guido Carosella, Wolfsbane/Rahne Sinclair) climbed atop the ship. (X-Factor I#110) - Jornik's ship suddenly began upheaving, and the Urg tore a hole in the side of the ship. The Urg's mass in relation to the ship rendered it unstable, and X-Factor (with the exception of Guido) jumped off and made their way to a nearby harbor. Guido unsuccessfully to communicate with the Urg, who growled and punched him away. Guido landed on and rebounded from a nearby boat, but the Urg released an electrical blast from its eyes that knocked Guido over onto the docks, where he was captured by Jornik. As Havok and Polaris attempted to keep it occupied, another blast from the Urg nearly struck Wolfsbane. Attempting to set up the Urg to be taken down by Havok, Polaris tried to manipulate it with magnetic force, but the Urg instead drained Polaris' electromagnetic field, causing her to fall to the dock below. 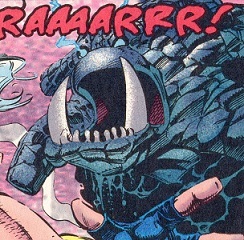 Fearing for Lorna's health, Havok fired a powerful blast that knocked it on its back, but the Urg rose again seconds later, howling in rage and/or pain. The creature's electrical energies were released into the grimy canal waters in which Havok stood, causing Havok to spasm and contort uncontrollably. A recovered Polaris pulled Havok out of the water, while the Urg turned away from them, picking a boat up over its head as growling loudly. Wolfsbane despaired that there seemed to be no way to stop the Urg, and Forge agreed, noting that its only purpose seemed to be outright destruction. Having located Jornik and rescued Guido, Lila teleported with Guido to the rest of X-Force. 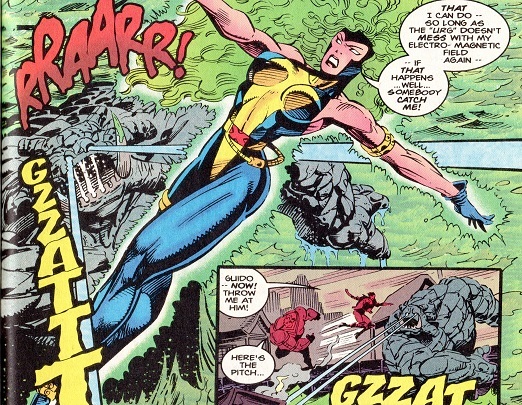 At Lila's instruction, Polaris levitated into the air and distracted the Urg, which fired eyeblasts she was able to evade, and then Guido threw Lila at the Urg. As Lila reached the Urg, she teleported it away. (X-Factor I#110 (fb) - BTS) - Lila returned the Urg to its native planet, where it could throw rocks and not get in trouble. (X-Factor I#110 - BTS) - Lila considered that since the Urg was back on its homeworld, no one need know it was accidentally hatched. Comments: Created by John Francis Moore, Todd Dezago, Jan Duursema, and Al Milgrom. I'd guess the name Urg is derived from the word "erg," which is a unit of energy. other Urg or Erg characters, etc.